Comic book artist and colorist Paul Hornschemeier drew some fun full page cartoons for Chicago Magazine over the twelve years that he lived here and I showed you one of them back here. But the gentleman and his family are moving to Boston this weekend. 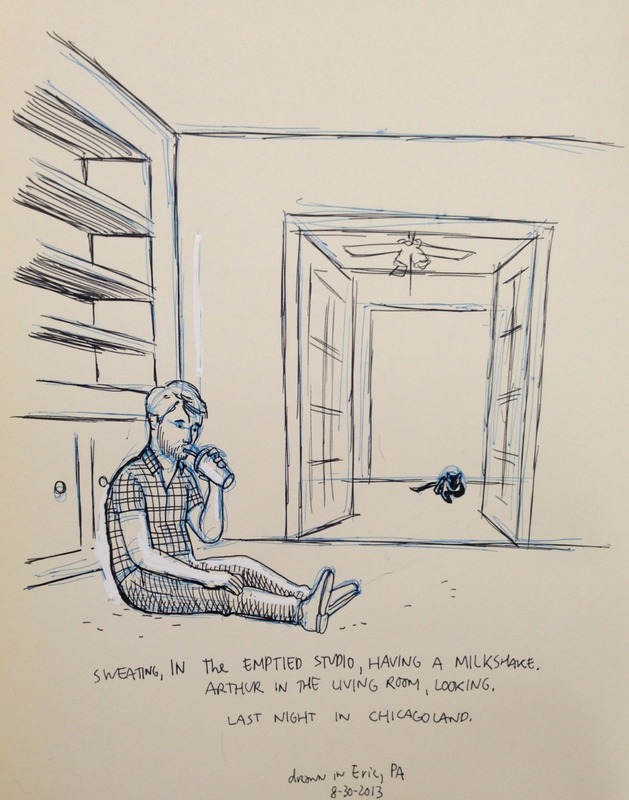 He wrote an article for his blog about the move and accompanied it with the above drawing. It's a wonderfully written essay about appreciation and about moving on and I hope you'll read it for yourself over here. The Before Watchmen comics offered variant covers drawn by the likes of Jim Steranko and Paul Pope and Tim Bradstreet? I never saw these before today! Many of the drawings are amazingly beautiful and, if they are new to you like they are to me, you can see more of them over here. 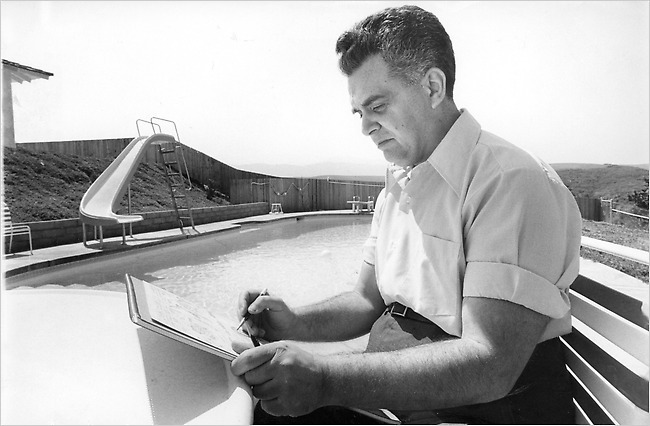 August 28, 2013 marks the 96th anniversary of Jack Kirby's birth. 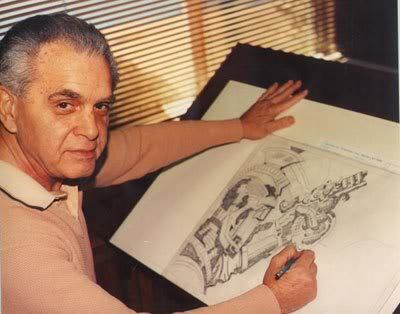 Jack Kirby, my favorite comic book artist of all time! I decided I would commemorate this anniversary by producing a portrait of the gentleman. I had never sat down and tried drawing Mr. Kirby before, but the time had arrived. I wanted my artwork to hinge on the occasion in some way rather than be merely generic. So then I put the pieces of the puzzle together and drew the portrait. That was fun! 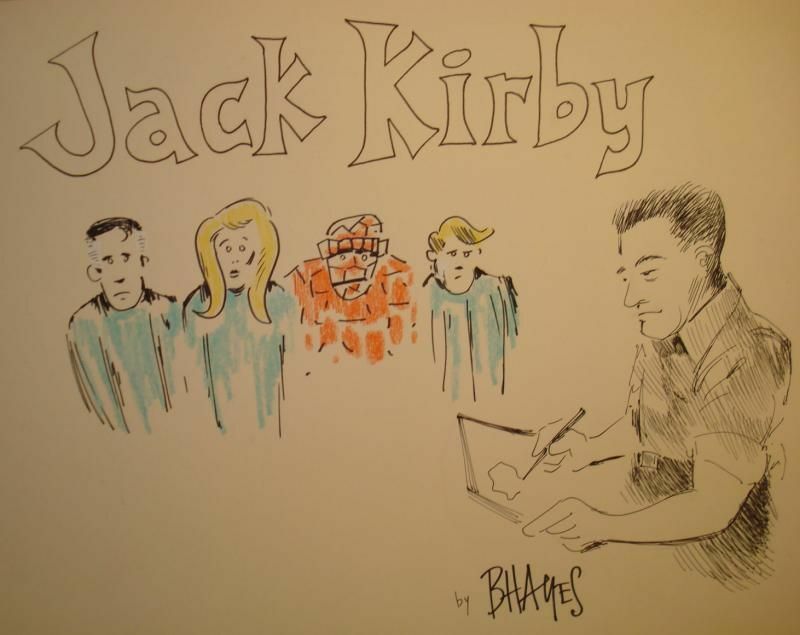 If you'd like to see some Jack Kirby birthday portraits by other artists, please do take a look right over here. The hardcover volume of The Strange World of Your Dreams is now available. It reprints stories from the offbeat Joe Simon and Jack Kirby series that ran four issues in the 1950s. I used to own a couple of the comic book issues and it's nice to see these stories again. I would never rail against a book of Jack Kirby comics but I do wish that this had been an archival reprinting of the four original issues in their entirety rather than just a smattering of the stories. Oh well. The Jack Kirby artwork is fabulous and the Ben Oda lettering is a treat. Plus, the cover of the book is soft-padded like a pillow. Great book! 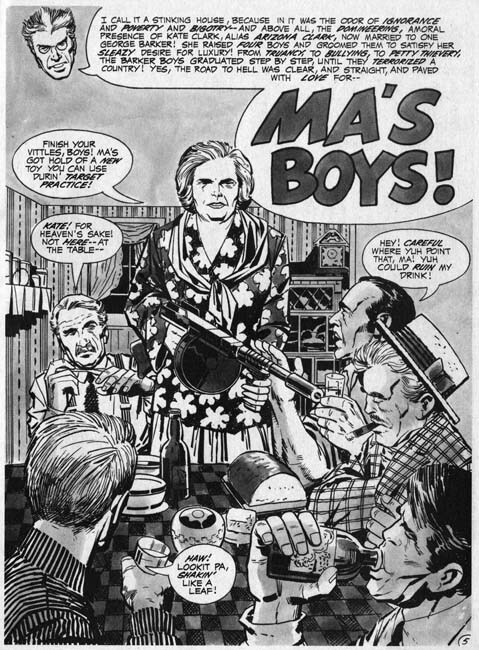 It's Jack Kirby Week in the hayfamzone! Wednesday marks the 96th anniversary of the gentleman's birth so it's appropriate for us to do a little celebrating. Today I'm going to do share with you a couple of videos of Mr. Kirby. Both of these are from long ago but I never viewed them before last week and maybe they've flown under your radar also. 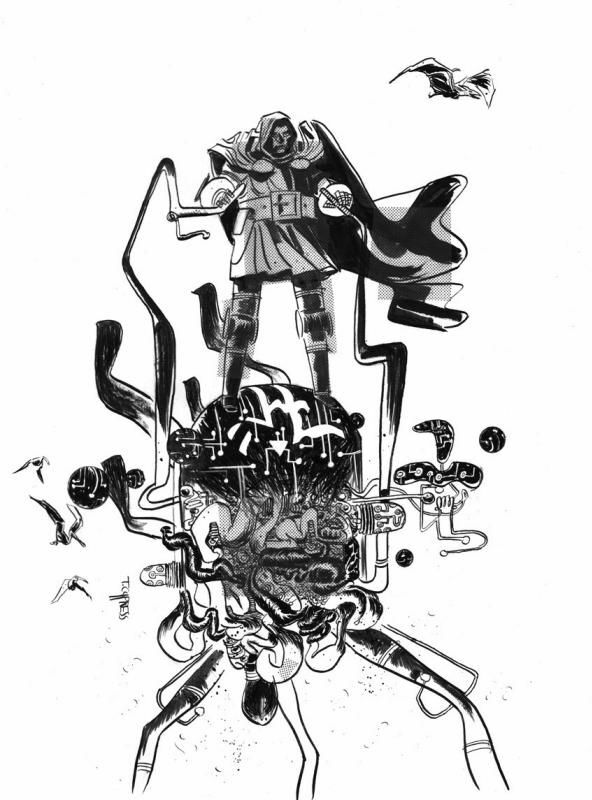 you can watch the drawing of a large head shot of Doctor Doom from start to finish over here. The festivities for Jack Kirby Week have barely begun! Get right back on the horse, isn't that what they say? 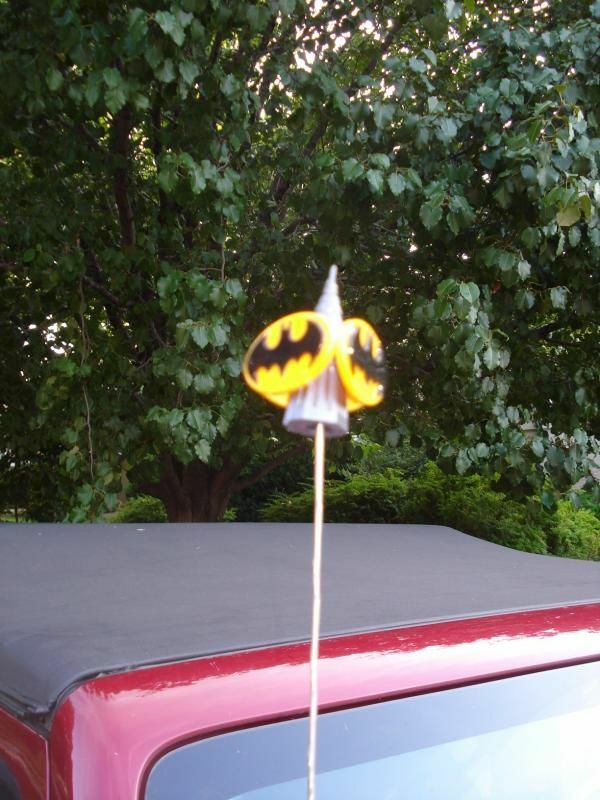 I told you back here that the Batman antenna topper on my car had been secreted away by an unseen scoundrel. That bad news is counterbalanced now by the good news that I have received a new topper in the mail from ebay. Whereas the previous edition was beautifully elliptical and round, that form is apparently irresistible to the scoundrels. An exact replacement was not available so I purchased a design that is a little less beautiful. You might even say it's somewhat on the grotesque side (but I probably would not go that far). The new Batman topper is triangular in nature, as can be seen in the above photo. And today is Day 1. 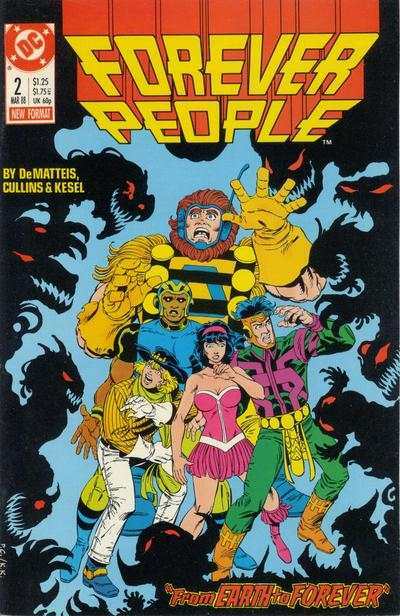 I have now reached the age that Jack Kirby was when he began his work on The Forever People and Mister Miracle and The New Gods (as well as Jimmy Olsen). Those are my favorite series of the gentleman's long and storied career, and I have written previously about how I credit Forever People #1 for guaranteeing my lifelong devotion to the artform of comic books. I can imagine there are some folks at my current age who might settle into complacency after working in their chosen field for a number of years. But Jack Kirby didn't. Instead he slammed four simultaneous homers out of the park, and he kept right on stepping up to the plate. I've known since I was a kid what age Mr. Kirby was when he wove his Fourth World tapestry. I did not know at that time what my career path would be, but I am here to self-report to you that I pop up out of bed every morning like an English muffin out of a toaster! Thirty-four years and counting, it's a thrill every day to get into my math classroom and I feel I am doing my best teaching ever. Thank you, Jack Kirby, for showing me the way! I like this painting by Ray Fawkes. But let's talk about the John Constantine character in the various comics for just a minute. He's a little too omnipresent. Pull back the reins a little bit and he'll run a longer race. And let's move beyond the continual lighting of the cigarette, can we? I salute anyone who has the patience to complete a project like this. You can see step-by-step photos of the planning and of the whittling process over here. 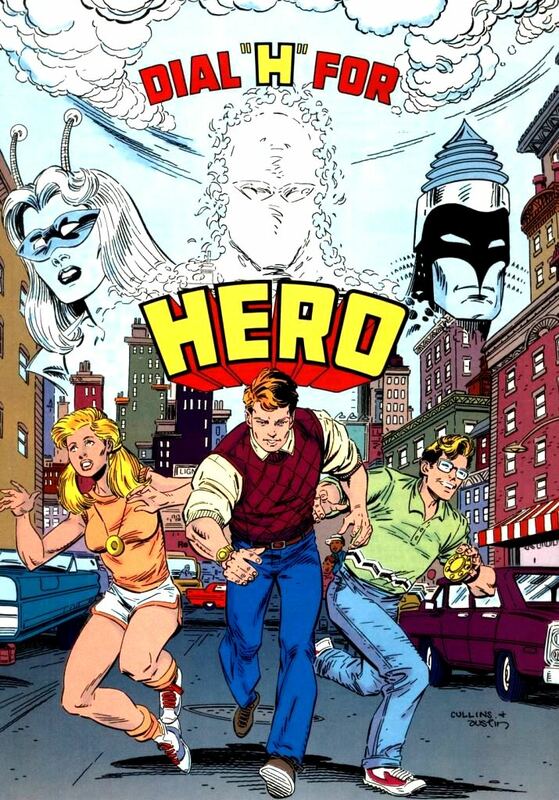 DC Comics' New 52 version of Dial H for Hero has just had its last issue published. The franchise began in the 1960s with Robby Reed helming the dial, then there was the 1980s revival with Carmine Infantino artwork, and now we've had fifteen issues with beautiful Brian Bolland covers. Wait, the Hayfamzone Research Fellowship just reminded me about the 1990s series that ran for 22 issues with Kano artwork. I had forgotten about that go-round! But that's leading in to my point. All these different versions of Dial H had worthwhile benefits, but the concept never achieved traction with the readers to sustain it for more than a couple of dozen issues. So retire the concept already, once and for all. It's a four-time loser. Let the creators wow us with new concepts instead of coaxing one more wheeze out of a horse that can run no more. 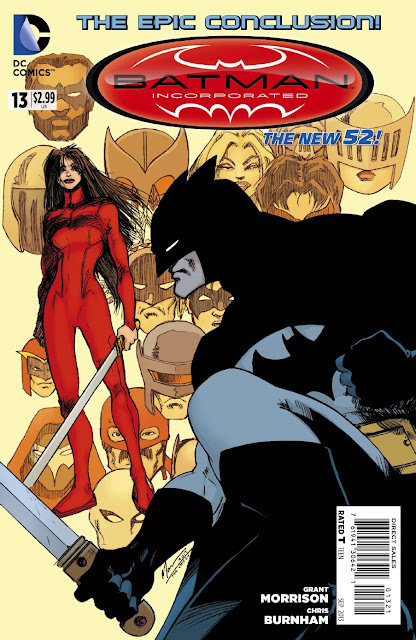 The New 52 is overpopulated with retreads that just don't cut it. I'm ready for an overload of freshness instead. Like The Movement. I'm enjoying that title quite a bit. Dial M for Movement. I received my hardcover edition of In the Days of the Mob this week and I'm happy to be able to report some good news. The page of creators' biographies has entries for Jack Kirby and Vince Colletta and Mike Royer. By the way, I wonder if you are as amazed as I am that these two hardcovers have both been published with the covers unchanged from how they appeared on their respective magazines back in 1971. So often the youngsters will have a "better idea" on how to "improve" things, and I think it's great that Mr. Kirby's classic designs made it through the editorial gauntlet unscathed. Also by the way, my favorite parts of both of these books are the Mike Royer-inked addenda pages that were meant for the never-published second issues of the magazines. Beautiful! Hey, is Doctor Doom riding a souped-up Astro-Glider he commandeered from Orion? But seriously (ha ha), doesn't this drawing look like Jack Kirby has been inked by Paul Pope? In fact, the artwork is by Toby Cypress and I think it is superb. 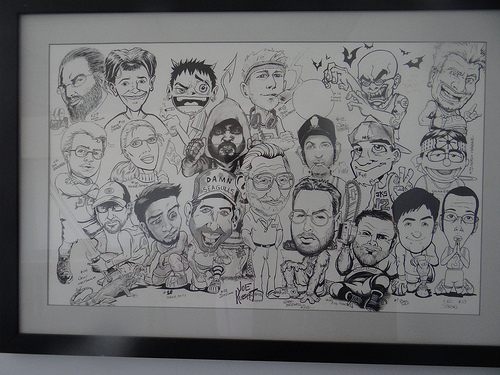 For just a little while longer, if you hurry, you can bid on the original artwork over here. Good luck! When writers draw! How about a Batman cover by Grant Morrison from last month and a one-page Sandman strip by Neil Gaiman from 1993? Enjoy! Jill Thompson is running a Kickstarter campaign to manufacture a sharp-looking Scary Godmother doll. If you really, really hurry, your Kickstarter pledge can get you not only one of the dolls but also a page of Jill Thompson original artwork! The race is on, though. There were 100 pages to start with and the pile has dwindled to just 15 remaining as I write this. I considered double-pledging to also receive one of the other incentives: a DVD of the Scary Godmother stage play that ran here in Chicago a little over ten years ago. It was great! I took my little hayfamzonders to see it twice and we were blown away by the great costumes and the general wonderfulness of the production. While the link still works, more information about this campaign and its incentives awaits you right over here. Robbing the Forever People, or Heralding Them? The design got jazzed up a bit under the able nib of Todd Klein for the 1980s Paris Cullins miniseries. Now take a look at the logo for DC Comics' upcoming Forever Evil miniseries. Isn't that basically the same 'Forever' (although let's not talk about what they did to the V)? And doesn't "Forever Evil" even rhyme with "Forever People" in a cockeyed sort of way? Jack Kirby's Fourth World creations of Mister Miracle and Orion of the New Gods have been making appearances in DC's New 52 universe, but The Forever People (and The Infinity Man) have not yet been sighted. Maybe, just maybe, is it possible that Forever Evil is designed to blast The Forever People into current continuity? We'll see! 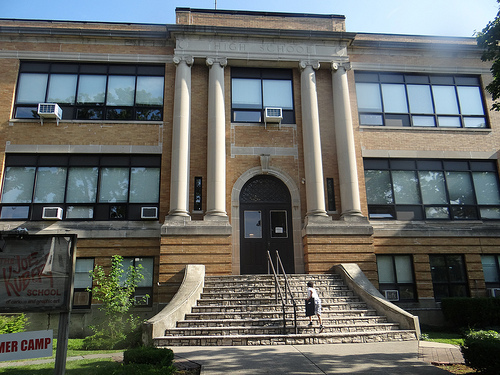 I have known about The Joe Kubert School since the year it opened almost four decades ago (and I even considered applying to be in the first or second class), but I never saw a photo of the outside or the inside of the institution. Until now! Here is a virtual tour of the facility by Brian Salvatore and I hope you find it as wonderful and enlightening as I do! Any time I come across a nice animated gif I am going to share it with you! I very much like this Dan LuVisi Secret Six #14 cover as animated by Josh, and I am looking forward to more great work from Josh in the future. 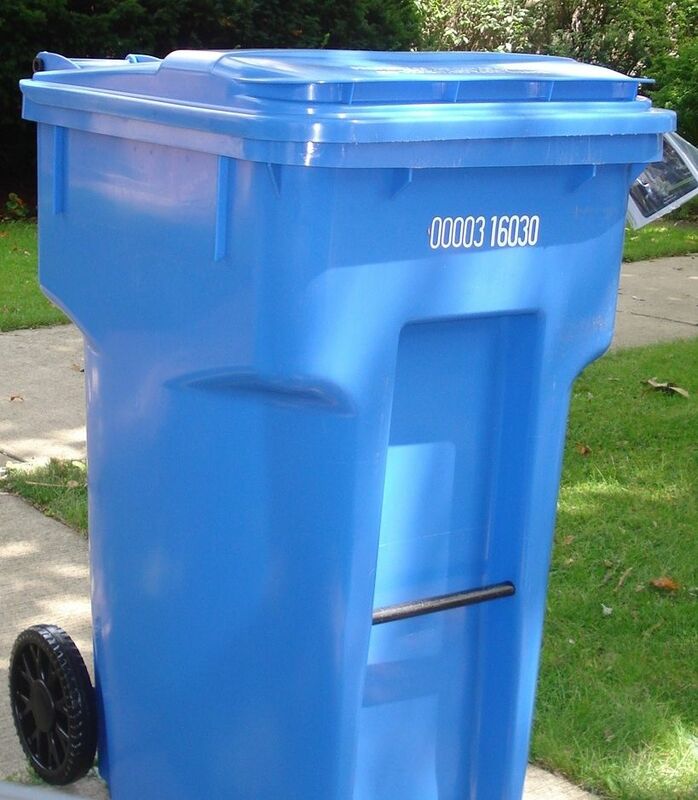 This week the city of Chicago delivered to me a long-promised blue bin for recycling. 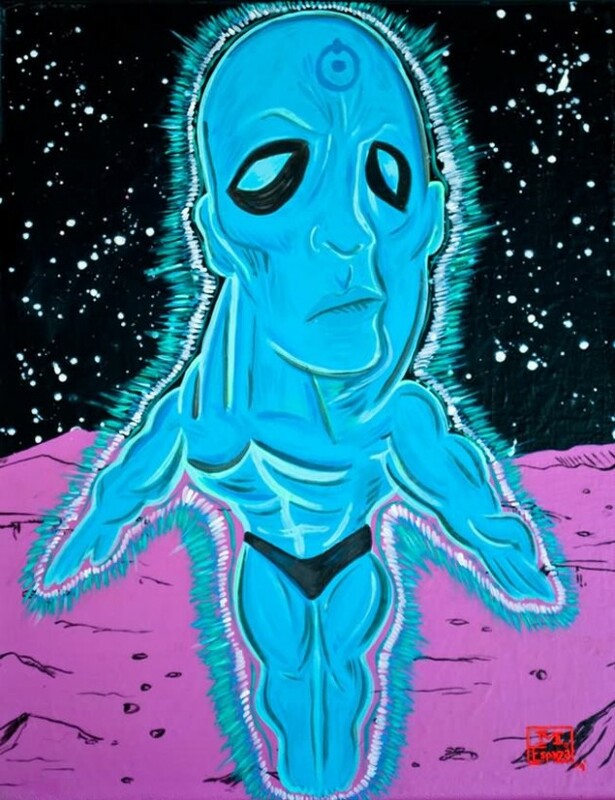 I noticed immediately that the bin is the same hue as Watchmen's Dr. Manhattan. I like the way Chicago thinks! Hooray for garbage in the hayfamzone! The WizardWorld Chicago convention begins tomorrow. The owners of Chicago's (notorious) Admiral Theater cleverly came up with a strategy to ride the wave of the pop culture event, and any over-eighteeners can investigate what it's all about over on the Admiral's website. 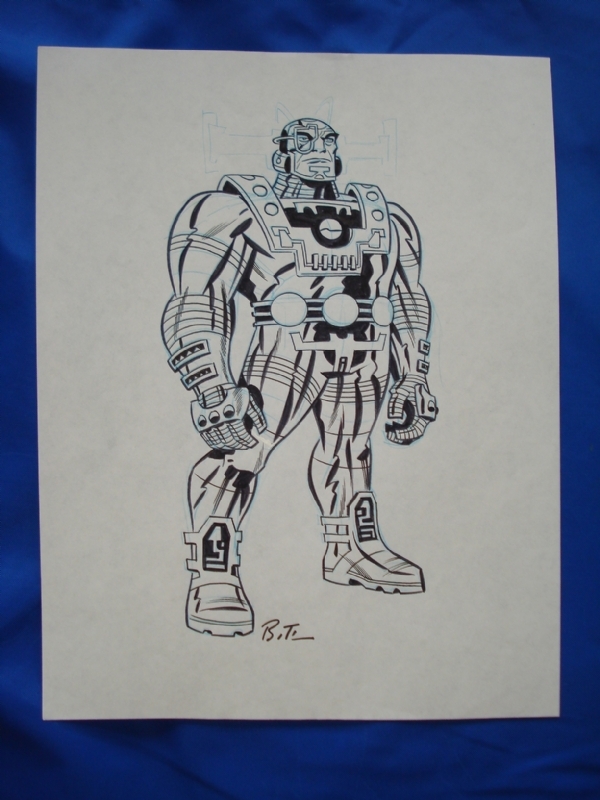 Here's a beautiful drawing by Bruce Timm that I was fortunate enough to win on ebay a couple of years back. Isn't it spectacular? And I was able to attain it for a very reasonable sum, far less than a drawing by the gentleman of Batman or Harley Quinn would command. I titled it "Kirby Character" when I posted it in my gallery on comicartfans.com, and I asked anybody with further information to please let me know. A well-informed chap named Tony Frickey wrote in to say "He was designed for a Fantastic Four project that never happened. Bruce Timm designed him but never named him." Well, now that the artwork resides in The Hayfamzone Collection, I am in the driver's seat and I will bestow upon this character a name. Hereafter he will be known as... The Hayfamzonder. Nick Fury, Agent of Shield #12 was dated March 1969 and marked Barry Smith's fifth interior-artwork assignment for Marvel Comics (and he also received a co-plotting credit for the story). Sid Greene, who had done such a nice job inking some Gil Kane Green Lantern and Atom stories for DC, was assigned to ink the Shield story and completed the job. Just one problem: Mr. Smith detested those inks on his pencils. 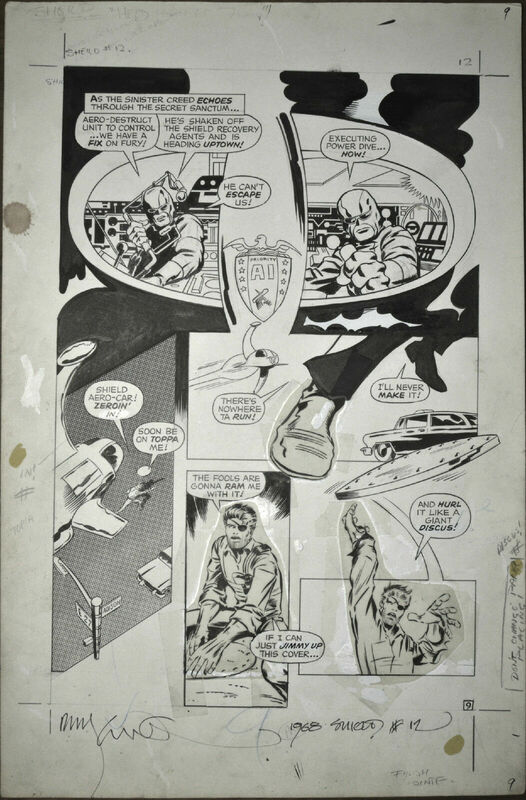 The above original page of original artwork from the issue was up for bid on ebay recently. The seller pointed out that most of the inking is on vellum overlay because Barry Smith re-did it himself over the span of one weekend rather than let the Smith/Greene collaboration see print. If I had bought this artwork I probably could not have resisted peeling back the overlay to peer at the secrets that were hidden underneath. I started the countdown back here, 374 days ago. That was a pretty long run. It stayed on my car antenna so long that I stopped worrying about it months ago and foolishly thought that it would remain on there forever. But I noticed today that it was gone. After all this time, somebody took it. 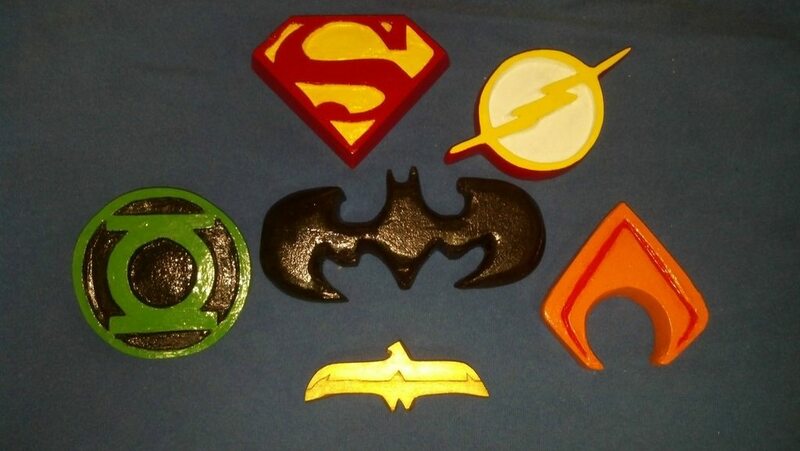 I like this animated gif of the Justice League as 8-year-olds by Yale and AVBH. And maybe you're ready to look again at some animated gifs I've shown in the past, like this Batman one and this Jack Kirby Superman one and these three assorted ones. Aren't they all great? "Super Position" is scholarly examination (from a political viewpoint) of superhero comic books in general and of the three Christopher Nolan Batman films. The classic covers featuring Batman and/or Superman that pepper the article are at once wonderful and perplexing because they don't in any way directly relate to the words that surround them; an analogy that comes to my mind is listening to classical music while watching a news show with the television sound turned down. My student Ami Zimmerman seems determined to cast me as a superhero! Back in the springtime Mr. Zimmerman acted the Mr. Hayes role in the Fasman Yeshiva Purim Shpiel, and in that play "Mr. Hayes" was indeed a superhero (whose only weakness was water? How about wood or the color yellow?). I do not have a copy of that Shpiel and it has not been posted online but, if the footage does make itself available I will defintely make sure you see "me" in action. But wait, there's more! Mr. Zimmerman is also an excellent cartoonist and he created a comic strip for the school newspaper in which, again, there "I" was doing some superhero-ing. His handiwork is on display up above and you can view a larger version over here. 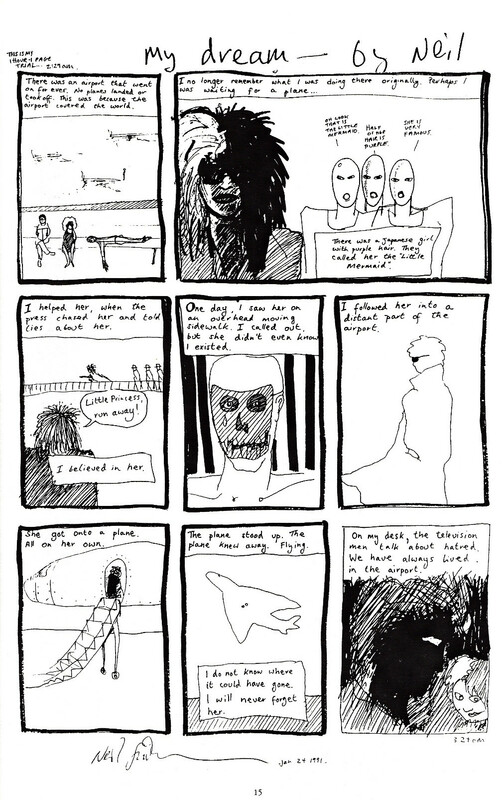 I am hoping that Mr. Zimmerman will draw more comics in the future.